the ongoing influence of the Summa Theologiae in modern philosophy and theology. Offering a close reading of the original work, this guidebook highlights the central themes of Aquinas’ masterwork and is an essential read for anyone seeking an understanding of this highly influential work in the history of philosophy. This study provides a map for navigating the intricate channels of the masterpiece of medieval theologian Thomas Aquinas (c. 1225-74). Given its size, Eberl (philosophy, Marian Univ.) 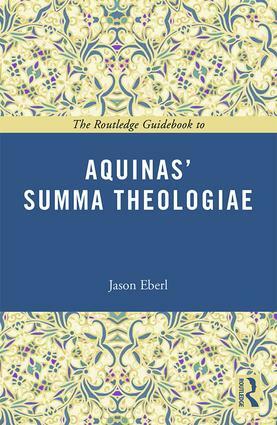 does not offer a comprehensive account of the Summa Theologiae but instead traces the general lines of its argument, identifying major themes along the way. A model of clarity, this volume unquestionably deserves a spot on the ever-expanding list of commentaries on the Summa. Jason T. Eberl is the Semler Endowed Chair for Medical Ethics and Professor of Philosophy at Marian University in Indianapolis, USA.